2017 Kenilworth June Modeling Day. A selection of photos and report from the 2017 Kenilworth June Modeling Day. 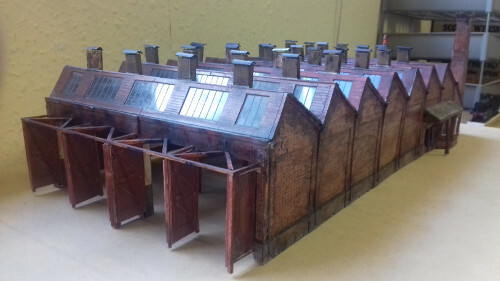 A view Dave Elwyns model of Buckingham Station building when removed from the layout. Dave has paid significant attention to details of the station right down to modelling the window boxes to create a very authentic model. Bob Williams NPCS 4 Wheel Milk Van. David Bonds display of predominantly PC kits both built and unbuilt. One of Peter's first carriages, where he built the sides up in layers of cardboard. Peter Chatham's P C test build models and various litreature about the company. Roger Stapleton, Phillip Millard (President of the L&NWRS) and Charles Stevens converse around the test track. Roger Stapletons 4 road northlight engine shed. The gentlemen enjoying Peter Chathams enthralling talk. 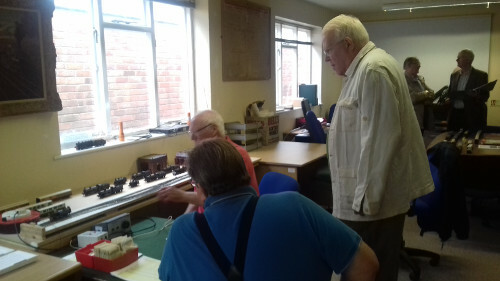 Members travelled from far and wide, Surrey, Newcastle and Pontypool to name a few, to the Jeremy Flegg Study Centre at Kenilworth to enjoy the modelling day held on the 1st July. 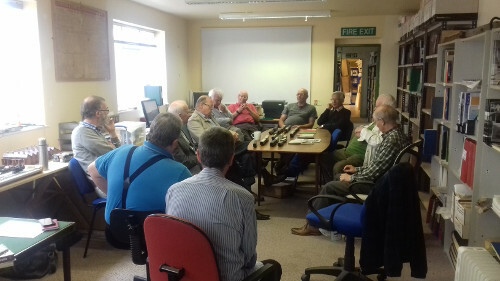 In all 16 members gathered to enjoy an enthralling account by Peter Chatham as to how P C Models came about. 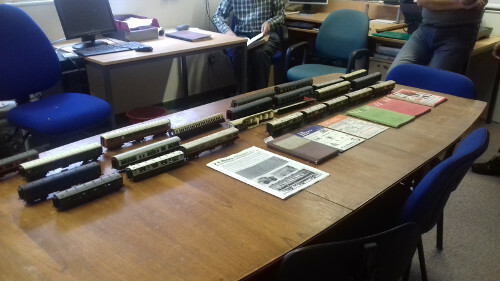 Peter supplemented his talk with a display of over 25 carriages, many of which were the test build models for some of his kits. He also had on display his first accounts ledger and a P C Models catalogue which showed the vast range of products that were produced. Peter started out by building a cardboard model of a 42ft carriage which appeared at plate XXV of George Findlay’s The Working and Management of an English Railway. One of the lessons he learnt at this early stage was the application of the livery was the hardest part. A commission to paint some locomotives built for a customer by Mike Sharman led to his first commercial product, the photo etched nameplates including many LNWR subjects. The sales of these nameplates grew to such an extent that Peter had to register for Purchase Tax, and still has his Sales ledger which includes many names from the history of the L&NWRS. A commission to build some carriages led to needing transfers for the finished articles. After failing to find a commercial company willing to take on the work, Peter visited the library to research screen -printing, bought some basic materials and equipment for £10 and started to produce Methfix transfers in December 1966, such as strips of LNWR ‘FIRST’ or ‘THIRD’ for carriage doors. Sales were acceptable but did not set the world alight, so following a conversation with his wholesaler W&H, the transfers were grouped into sheets for the respective companies, sales grew rapidly and this contributed substantially to Peter’s living for many years. The Pressfix range came about from a conversation with another wholesaler, W&T, who advised Peter that some people struggled with the application of the Methfix transfers, and so after some further research the Pressfix range were introduced and sales showed that they were very popular indeed. 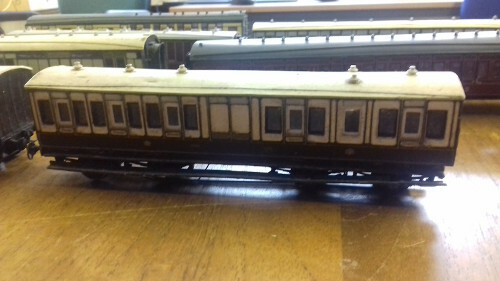 The first carriage kits appeared in November 1967 and soon proved themselves to be very popular. Originally they had white metal cast ends and bogies, with vac formed roofs and inner lower sides and floor, and later tinplate inner sides. 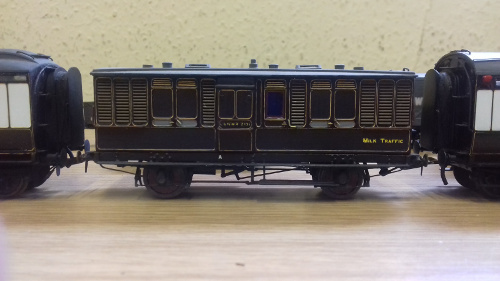 Improvements were made by use of aluminium extrusion for the roof and tumblehome, and also using etched brass to make the ends and bogies, which was soon followed by the predominantly etched brass kits for the horse box, prize cattle wagon and carriage truck. Towards the end, the carriage kits were becoming a financial headache, in largely because by selling them wholesale they were just breaking even, so the decision was made to go retail only. When the opportunity arose to take early retirement, and aghast at the news the transfer range might be lost, Philip Millard stepped in and brokered a deal for HMRS to take the transfers over. A further approach ensured that for some years later the carriage kits also remained available. Peter closed his presentation by opening up to questions from the floor. Philip Millard commented “Peter, I have known you for over 50 years and you have done more for modelling the LNWR than anyone else, your transfer range was and still is essential and your carriage kits were a huge leap forward for the time, and I wish to publically thank you for making modelling of the LNWR possible” Phillip Holme also commented that Peter had made modelling of the LNWR possible for the many as the livery finishing was the hardest part which Peter had resolved by printing carriage sides. Dave Elwyn asked where Peter had found his prototype information from, to which Peter replied that it had come from a range of sources, such as from Philip, drawings slowly became available as well, books of the time were a help, and latterly on its formation, the L&NWR Society. The afternoon was spent in admiring models which people had brought along and in discussion about all things modelling the LNWR. Roger Stapleton brought along his 4 road Northlight Engine Shed and Coal Hole, some of his many locomotives, including the K’s 4-40 Metropolitan tank, and a number of PC carriages including some LSWR of which he finds the livery most attractive. He also had with him his test track which saw plenty of use, especially for Philip Holme's 0 gauge 'Coal Tank' No.549 and 'Jumbo' No.868 that he had brought along, together with some engineering department wagons and NPCS vehicles. These included a horse box, a combination van, and a six-wheeled passenger brake van. 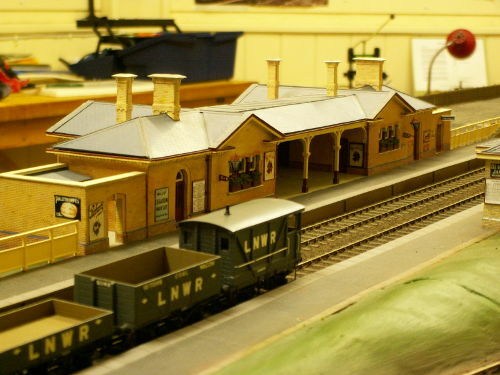 Dave Elwyn had on display his model of Buckingham Station which he has built from scratch in plasticard using Slater’s brick sheet. The ground plan was measured on site from the remaining foundations after demolition, the rest of the measurements were determined from counting bricks in photographs and by reference to drawings of St Albans station building which was similar. He also had his Cauliflower engine No.1267 (later LMS 8367) which he has built in EM gauge from a George Norton kit, and a rake of five 30’1” carriages and an earlier 32’ coach, destined to run on Buckingham LNWR, using Micro Rail and Modeller’s World brass etches and adapted Brassmaster Cleminson underframes. He also had an LNWR 30’ LQ signal under construction in brass using a Masokits tapered post and various MSE and Brassmaster parts, also destined for Buckingham. Bob Williams had on show a number of scratch built wagons, including three large cattle wagons in differing period liveries with lime wash staining of the lower planks. Bob also had on display a 4-wheeled NPCS Milk Van and a 45ft clerestory-roofed bicycle van as later used for milk traffic (as D381B) which he built whilst still at school. 0 gauge was further represented by the four locomotives that Philip Millard had on display. Of particular note of these exceptionally constructed models was the LNWR Southern Division “Bloomer” 2-2-2 No. 373, and the 2-2-2-0 Webb “Teutonic” class compound No. 1309, “Adriatic”. The other two models that Philip had brought along were the Webb “Jubilee” class 4-4-0 No. 1901 “Jubilee” and Webb 5ft 6in 2-4-2T No. 1191. 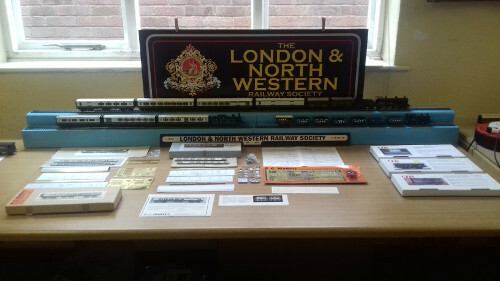 Also on display were the four gauge one locomotive models that Philip so generously purchased and donated to the society. Simon Weston brought along his recently purchased 00 gauge Railcar which he is in the process of refurbishing, having completed the bogies, he is now moving onto tidying up of the livery. Finally, your author had on display seven PC carriage kits that he has built as well as two unbuilt kits, one of which had the white metal parts and tin plate inner sides, and the other had the later improved aluminium and etched brass parts which Peter had described during his talk. Also on display was the first advert for the LNWR PC carriages from December 1967 which I had found in an old Railway Modeller. This display was complemented by kits for the three previously described NPCS vehicles which are still available from 51L, and are awaiting building by Steve Johns. That the brass kits and transfer range are still available now some 50 years later through 51L and HMRS, proves that Peter has created a lasting legacy in the model railway world.